SAD JINGO has a very long history with me, and I’m stunned that it’s finally published, and that I had a hand in publishing it. Jingo Dalhousie — a frustrated piano player working as a janitor in his cousin’s Greenwich Village night club, a misfit, a man who is just not all there. The kind you can find on any NYC street corner. Jingo harbors impossible dreams of playing the piano like his idol, Thelonious Monk. When a blockbuster debut novel features a character with his own unusual name, Jingo believes it can’t be mere coincidence, and he decided to track down the author. If only he can meet her, and play for her, then maybe — just maybe — he’ll be able to finally free the music trapped inside his head. But unknown to Jingo, the author has a secret of her own that she is desperate to protect . . . However, as much as I loved SAD JINGO, I just wasn’t successful selling the book. Dave Stern was working at Pocket Books at the time. He read SAD JINGO and enjoyed it. But it just wasn’t right for what he was publishing. The most frustrating experience though was when Larry Ashmead, an acclaimed editor, read SAD JINGO and loved it. I still remember the two-page fax he sent on a Monday morning after he read SAD JINGO over the weekend. But, sadly, as acclaimed as Ashmead was, he couldn’t pull the trigger on buying the book for HarperCollins unless HarperCollins’ paperback division was equally enthused. Unfortunately, they weren’t. After I left book publishing for the PR biz, +Ron Dionne the author of SAD JINGO, and I remained friends. He shelved SAD JINGO and worked on other novels and short stories. Some months, and probably some years, Ron stopped writing altogether. After I started publishing eBooks, I immediately thought about Ron and SAD JINGO. 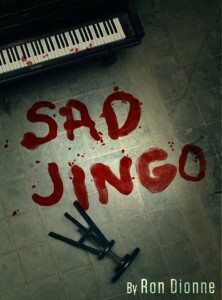 And, after many, many years SAD JINGO is now available for the reading public. Of course, I encourage you to give it a try. It’s available today for Nook and Kindle. It will soon be available for iBookstore, and Kobo.